Ronnie O'Sullivan became world number one for the first time since 2010 by edging a thrilling Tour Championship final against Neil Robertson. 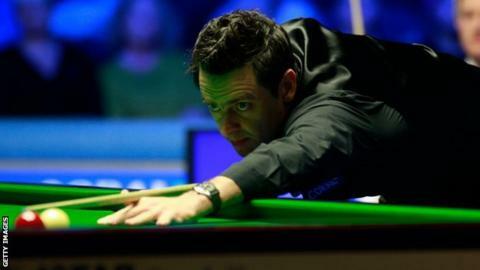 O'Sullivan led 5-3 overnight in Llandudno but Robertson had the better of Sunday's first session to reach 8-8. He levelled again at 10-10 but never led and an 89 saw O'Sullivan win 13-11. "To get to number one probably playing half the events some other guys do is probably one of the best achievements across sports," said O'Sullivan. "I've never been driven by number one as if I was I'd probably enter a few more tournaments," added O'Sullivan, who overtakes Mark Selby at the top of the world rankings. O'Sullivan's success also sees him tie with Stephen Hendry's record of 36 ranking titles. 'The Rocket' could surpass the mark at the World Championships in Sheffield, which begin on 20 April. "Congratulations to Neil - him and Judd Trump have been the two best this season along with myself," he added. "If one of us doesn't win the World Championship I'll be surprised." Earlier in March, O'Sullivan became the first man to reach 1,000 career centuries when he sealed a 10-4 win over Australia's Robertson in the Players Championship final. They both won a session 5-3 to go into the final session in Llandudno at 8-8, and O'Sullivan signalled his intent with a 129 to edge ahead. He was on the verge of victory at 12-10 but Robertson dug out a break of 56 to prolong matters until O'Sullivan produced an 89 before saluting the a jubilant crowd. Manchester City made "The Theatre Of Dreams" a house of pain for Manchester United as they brutally demonstrated the gulf between themselves and their fierce rivals. BBC Sport charts the emotions of the Liverpool supporters who found themselves cheering on fierce rivals Manchester United.